Geopolitical ambitions aside, India’s pact with ASEAN highlights a growing concern many have with Southeast Asia – the threat of regional terrorism. Last year’s Battle of Marawi shows that the threat of terrorism in the region is still pervasive. According to The Manila Times, 47 civilians were killed as a result of the siege by militants associated with ISIS and Abu Sayyaf. The Economist reports that 1.1 million civilians in Marawi have been displaced because of this conflict. One of the main concerns for the region in 2018 is the threat of returning ISIS fighters from Syria and Iraq. The New York Times said in September last year that more than 500 Indonesians have joined ISIS in Syria, while Malaysian daily, The Star reported that there are about 60 Malaysians fighting in Syria as of last year. The Battle of Marawi last year has also raised several other concerns about the state of terrorism in the region. Sidney Jones said that the coalition of ISIS affiliates in Marawi last year indicates that regional groups from different countries are working together. She said that ISIS forces fighting at the Battle of Marawi received help from a significant number of ISIS converts from outside Mindanao as well as from foreign operatives hailing from Malaysia and Indonesia. According to Sidney, different groups banding together gives the alliance a much larger reach and creates a diversity in tactics for them to exploit. The persecution of Muslims in Thailand and Myanmar has also worried some observers that non-local Islamist extremists might use this opportunity to recruit. Foreign Affairs magazine reported last year that al-Qaeda has already made a call to arms against the government of Myanmar. Reuters reported last year that Malaysian authorities have detained a suspected ISIS follower who was planning to carry out terror attacks in Myanmar. 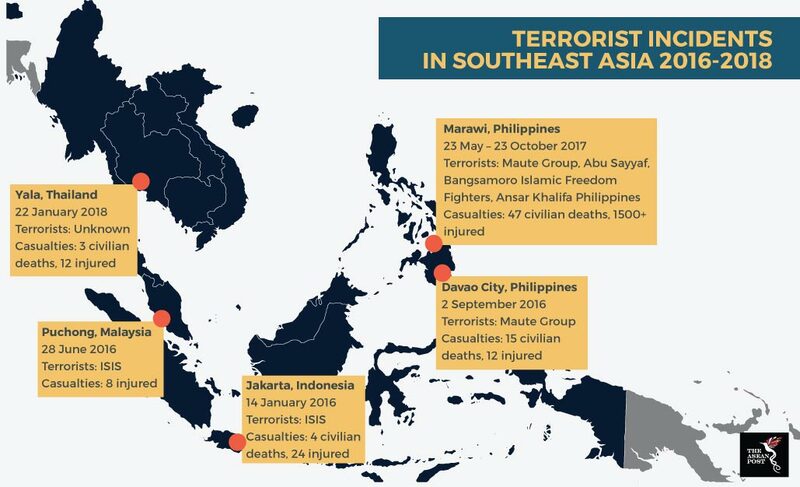 The prospects of terrorism in the region this year may seem worrying, but Joseph Chinyong says the operational capabilities of Southeast Asian militant groups remain limited and mass casualty attacks are still unlikely. “Though eliminating terrorism altogether would be a tall order, the threat is certainly manageable if the correct balance of perspective and policies are taken, and cooperation among regional states is enhanced,” he explained.